Variable frequency drives can operate as motor protection devices along with their role as motor speed controllers. Some variable frequency drives have short-circuit protection (usually in the form of fuses) already installed by the manufacturer, as shown in the variable frequency drive diagram. The selection & sizing of these fuses is critical for semiconductor protection in the event of a fault. The VFD manufacturer's recommendations must be followed in installing or replacing fuses for the variable frequency drive to assure fast operation of fuses in case of a fault. When a variable frequency drive is not approved for overload protection, or if multiple motors are fed from the VFD, one or more external overload relays must be provided. The most common practice is to use a motor overcurrent relay that will protect all three phases & protect against single phasing. With AC motors, there is excessive energy generated when the load drives the motor during deceleration, instead of the motor driving the load. 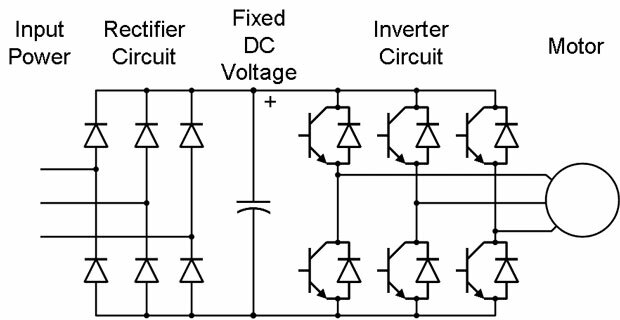 This energy goes back into the VFD & will result in an increasing DC bus voltage. If the bus voltage goes too high, the VFD will be damaged. 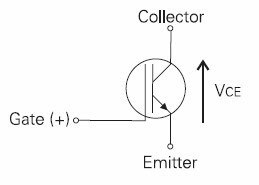 Depending on design, a variable frequency drive can redirect this excess energy through resistors or back to the AC supply source. When dynamic braking is used, the VFD connects a braking resistor across the DC bus to absorb the excess energy. For smaller horsepower motors, the resistance is built into the VFD. External resistance banks are used for larger-horsepower motors to dissipate the increased heat load. Regenerative braking is similar to dynamic braking, except the excess energy is redirected back to the AC supply source. Variable frequency drives designed to use regenerative braking are required to have an active front end to control regenerative current. 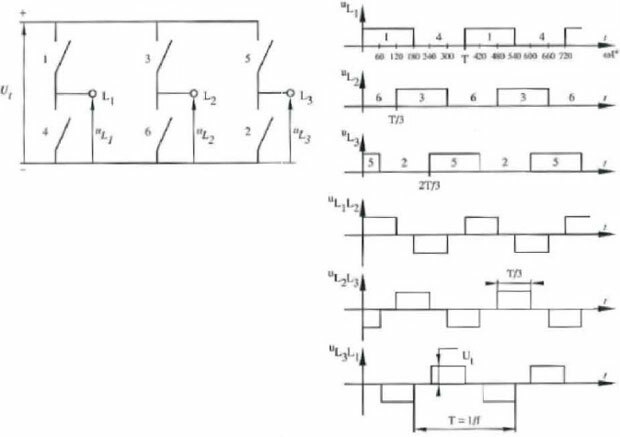 With this option the diodes in the converter bridge are replaced with IGBT modules. 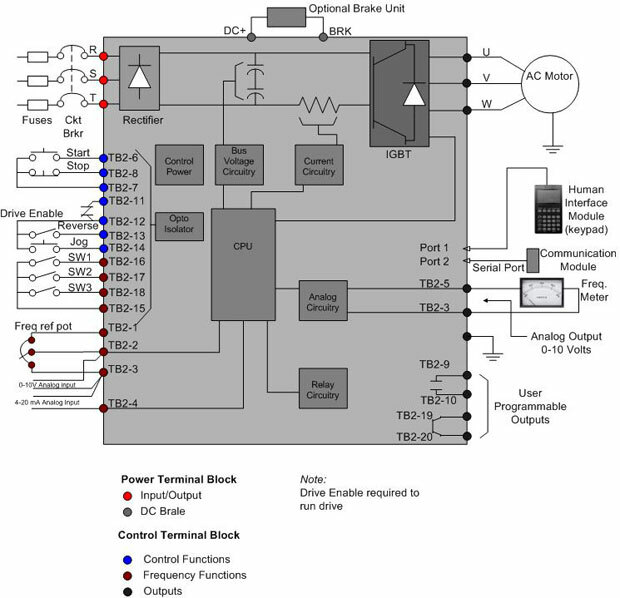 The IGBT modules are switched by the control logic, & operate in both motoring & regenerative modes. DC injection braking is a standard feature on a number of VFDs. 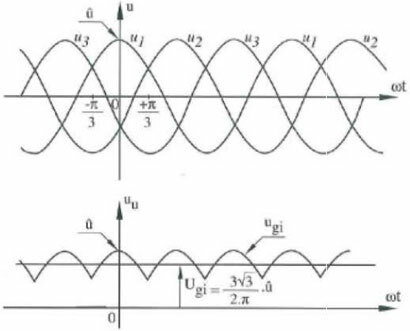 As the term implies, DC injection braking generates electromagnetic forces in the motor when the VFD in stop mode, injects direct cur rent into the stator windings-after it has cut off alternating current supply to two of the stator phases-thus turning off the normal rotating magnetic field. Most DC injection braking systems have the ability to adjust the length of time they will operate & the maximum torque they will apply. They generally begin braking when they detect that the motor is no longer receiving its run command & come equipped with hardware to prevent the motor from receiving another run command until the braking is finished.